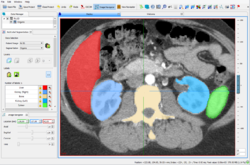 The Medical Imaging Interaction Toolkit (MITK) is a free open-source software system for development of interactive medical image processing software. MITK combines the Insight Toolkit (ITK) and the Visualization Toolkit (VTK) with an application framework. 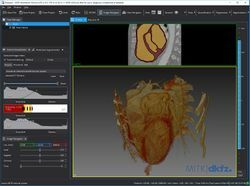 As a toolkit, MITK offers those features that are relevant for the development of interactive medical imaging software covered neither by ITK nor VTK, see the Toolkit Features for details. MITK can be used or integrated with existing solutions in several ways, see Research Platform for examples. NVIDIA just announced the Clara Train Annotation at the GTC 2019 Keynote (jump to 01:25:00), which allows you to rapidly segment organs with a few clicks! 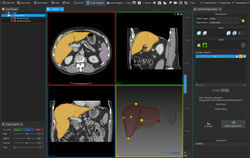 In a cooperation between the German Cancer Research Center and NVIDIA, we already integrated this new technology into our segmentation tools in our recent MITK Workbench release 2018.04.2. Learn more about this exciting new feature. MITK 2018.04.2 has been released. Most fixes are related to multi-layer/multi-label segmentation and the build system. We are happy to announce that we, in a cooperation with NVIDIA, integrated the NVIDIA AI-Assisted Annotation in the form of two new Segmentation tools. These tools use the power of the NVIDIA GPU cloud to greatly accelerate the segmentation of organs with only a few clicks. More information. Read the full release notes and a list of highlights. You can download an installer containing the MITK Workbench application with and without NVIDIA AI-Assisted Annotation tools for Windows, Linux, and macOS. MITK 2018.04 has been released. Highlights include extended DICOM support (RTSTRUCT, RTDOSE, RTPLAN, SEG), improved macOS support, and a dark theme. You can download an installer containing the MITK Workbench application for Windows, Linux, and macOS. MITK 2016.11 has been released. You can download an installer containing the MITK Workbench application for Windows and Linux. January 2017: MITK Users Meeting 2017: We reschedule the MITK Users Meeting. Please contact us for more information. June 2016: Thank you for joining the MITK Users Meeting 2016. We are very happy about the great response and thank all contributors for making the meeting the success it was. We have managed to upload most of the slides as far as they are available. The photos taken during the tutorial and workshop days are online as well. Take the time and have a look at the website, it’s worth it! April 2016: MITK 2016.03 has been released. Read the full release notes and a list of highlights. You can download an installer containing the MITK Workbench application for Windows, Linux, and OS X.
June 2015: MITK 2015.05 has been released. Within this release several third party toolkits have been upgraded. Read the full release notes and a list of highlights. You can download an installer containing the MITK Workbench application. May 2015: Thank you for joining us for the 1st MITK Users Meeting. We are very happy about the great response and thank all contributors for making the meeting the success it was. The slides can be found here. January 2015: We are happy to announce the first MITK Users Meeting! It will take place on April 27-28, 2015 in Heidelberg. For further information please have a look here and here you can find the agenda! December 2014: The 2nd MITK Hackfest took place from 8-12 December, 2014 in a small town near the Black Forest in Germany. The topics we worked on during this interesting and highly productive week can be found here. November 2014: Based on the 2014.10 release there is also a new MITK Diffusion release available here. November 2014: MITK 2014.10 has been released, containing many new features and bug fixes! You can download an installer containing the MITK Workbench application for Windows, Mac OS X and Linux here. March/April 2014: MITK 2014.03 has been released. Within this release several third party toolkits have been upgraded and additional the minimum required version for Cmake and Qt. You can download an installer containing the MITK Workbench application for Windows, Mac OS X and Linux here. December 2013: MITK 2013.12 has been released. Within this release the MITK Geometries have been redesigned and mitk::ScalarType has been changed from float to double. Furthermore the MITK dicom plugin is now using the new CTK dicom widgets. You can download an installer containing the MITK Workbench application for Windows, Mac OS X and Linux here. December 2013: Image Guided Therapy (MITK-IGT) Modules and Plugins 2013.12: MITK 2013.12 release comes together with a source code release of the module and plugins for image guided therapy (MITK-IGT) including many bug fixes and new features. Tracking devices and tools created with the existing IGT plugins are now available as microservices objects (more Information: here) and can easily be accessed and reused globally throughout MITK. To demonstrate the new features we revised the IGT tutorial and extended it to four steps. Details of these and many more changes can be found on the page MITK_IGT_ReleaseNotes_2013.12. Starting with this release, IGT code will be part of the release cycle of MITK and tested before every release together with the MITK core to assure good code functionality and quality at the time of the release. November 2013: MITK Diffusion 2013.09.04 has been released, this bug-fix release mainly addresses stability issues in the head-motion correction. Installers for the major platforms can be found here. October 2013: MITK 2013.09 has been released. This release contains an impressive number of feature additions (smaller and larger ones) and again a high number of bug fixes. You can download an installer containing the MITK Workbench application for Windows, Mac OS X and Linux here. October 2013: MITK Diffusion 2013.09 application has been released as well. Installers for the major platforms can be found here. June 2013: MITK 2013.06 has been released. This release officially introduces support for ITK4. You can download an installer containing the MITK Workbench application for Windows, Mac OS X and Linux here. April 2013: MITK 2013.03.2 has been released. This is a source-code only bug-fix release on top of the 2013.03 release. April 2013: MITK Diffusion 2013.03 application has been released as well. Installers for the major platforms can be found here. March 2013: MITK 2013.03 has been released. You can download an installer containing the MITK Workbench application for Windows, Mac OS X and Linux here. December 2012: MITK Diffusion 2012.12 application has been released. Installers for the major platforms can be found here. The source code is available in the GIT repository. December 2012: MITK 2012.12 has been released. Download an installer for Windows, Mac OS X and Linux from here. October 2012: The MITK Diffusion 2012.09 application has just been released. Installers for the major platforms can be found here. The source code is available in the GIT repository. September 2012: MITK 2012.09 has been released.Download an installer for Windows, Mac OS X and Linux from here. June 2012: MITK 2012.06 has been released. Download an installer for Windows, Mac OS X and Linux from here. May 2012: The MITK Diffusion 2012 application has been released. Installers for the major platforms can be found here. The summary of new features is listed here. November 2011: MITK Diffusion 2011 application has been released. the installer are still available in the release archive. June 2011: The BlueBerry framework has been changed to rely on the CTK plugin framework. See the BlueBerry page. March 2011: We are now using the ExternalProjects feature of CMake (aka Superbuild) to download, configure and build all projects in one run. See the updated build instructions page for details. 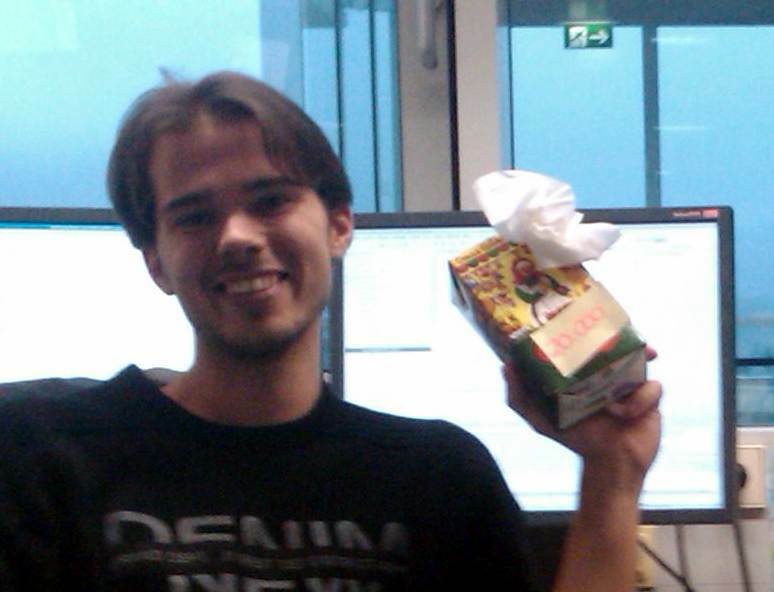 March 2011: MITK has moved to Git. See MitkGit for details. November 2010: mint medical presents the new version of MITK 3M3 at the RSNA in Chicago. November 2010: MITK 1.0beta1 has been released. This is the first snapshot release preparing MITK 1.0 . April 2010: The public dashboard has moved from my.cdash.org to cdash.mitk.org. March 2010: Slides of the BVM 2010 tutorial available on the Documentation page. December 2009: MITK 0.14 has been released. This is the first Qt3-free release and the last milestone before MITK 1.0 . November 2009: mint medical presents a MITK based application at the RSNA in Chicago. June 2009: MITK 0.12.2 is available for download. 0.12.2 fixes minor issues in the MITK application, major fix enables building from the downloadable archives. May 2009: MITK Release 0.12 is available for download. Take a look at the Release Notes. MITK 0.12 is the first Release that includes the new MITK-IGT component for building Image Guided Therapy applications with MITK. October 2008: MITK 0.10 is released. This page has been accessed 951,473 times.